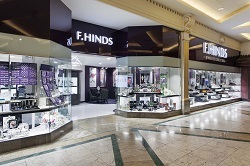 Perhaps you have noticed F.Hinds on one of the many high streets and in shopping centres across England and Wales, and we hope we have had the pleasure of serving you in one or more of our 115+ branches or here at our online store. In 2016 we proudly opened our 117th and 118th store in Doncaster and Harlow and are always looking for the next suitable premises. We recently undertook a huge project to redesign our branch in the Trafford Centre which now boasts our new brand colours throughout with a sleek and modern edge. We hope to use as many of these modern elements as we can in our future shop designs. Established in 1856, our independent, family owned and run business celebrated 160 years in 2016. In 2013 we welcomed Paul into the family business (the Managing Director's eldest son) who was swiftly followed by his younger brother Jeremy in 2014. Both brothers represent the 7th generation of Hinds's and play active and key roles within the business. Paul's wife gave birth to the very first 8th generation family member, Nicholas, in 2015 and I'm sure we will see exciting things to come from him when his time comes! With roughly 1,000 members of staff across all branches and Head Office, our large business offers a comprehensive, award winning training program within a unique working atmosphere. 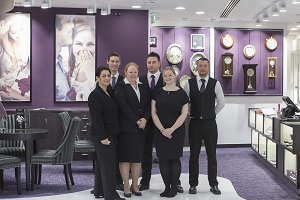 We offer the opportunity for staff to gain nationally recognised jewellery qualifications and are very proud to have been voted Family Business of the Year in 2014. Click if you would like to find out about Careers at F.Hinds. We offer an extensive selection of diamonds, gold and silver jewellery, watches, clocks, collectibles and gifts and we're told we have an enviable reputation for friendly and professional customer service. We are proud that this standard of service, selection, quality and value is also available here online. Our high street presence and long history should also help to give you the confidence to purchase online from us. We care about our customers, and aim to assist you in every way we can to make shopping with us easy and relaxed. You can shop with us online or over the telephone on 01895 201040 (lines open weekdays, 9am - 5pm). Alternatively, you can browse through our brochure (printed biannually) or take a look at the website and then come to a store to view the pieces for yourself. Click here to request one of our catalogues. Online since 1997, we've fulfilled thousands of orders including engagement rings, wedding rings and important presents such as watches, gold and silver jewellery plus gifts and branded collectibles at every price. We value your comments and would welcome your feedback about our website and indeed any features you think we can improve. Please email us at onlinesales@fhinds.co.uk with your comments. We hope you enjoy your visit to F.Hinds Online and look forward to seeing you in one of our branches soon.